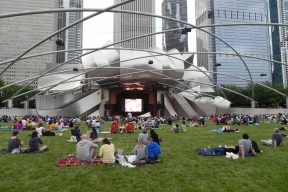 Chicagoans and visitors alike are invited to vote for their favorite Chicago film—to be screened at the finale of the popular Millennium Park Summer Film Series which runs Tuesdays, June 21 – August 30, at 6:30pm. Voting is now open online at chifilmfave.org (and on-site at the Summer Film Series), and ends August 16. The top vote-getter will be announced on August 23, and screened on Tuesday, August 30, at 6:30pm. Fans may vote for their favorite among the list of 20 Chicago-made films, which was created by the Chicago Film Office at the Chicago Department of Cultural Affairs and Special Events. Some of the movies are: Adventures in Babysitting; Ali; Color of Money; My Best Friend’s Wedding; and While You Were Sleeping. To learn more or view the complete list, visit millenniumpark.org.